Have you ever said that after getting out of bed? This happens because of low-quality mattresses. And when such a serious issue as scoliosis is present, the situation with your old mattress gets too serious. To save you from further back issues and hurting all over, I’ve prepared 7 best mattresses for scoliosis suffers. Let’s see, which one turns out to be the perfect one for you. Studying the Essence: Which Material Is the Best? Wool comfort layer. 25-year warranty, 100-night sleep trial, 100-night comfort level exchange. Quilted cotton cover. 15-year warranty, 120-day in-home trial. The first item on our list of the best mattresses for scoliosis is this hybrid model by DreamCloud. It has a very luxurious feel and features a smart combination of layers, which results in superb comfort and great support. Now, DreamCloud uses foam, latex, and coils in this mattress. 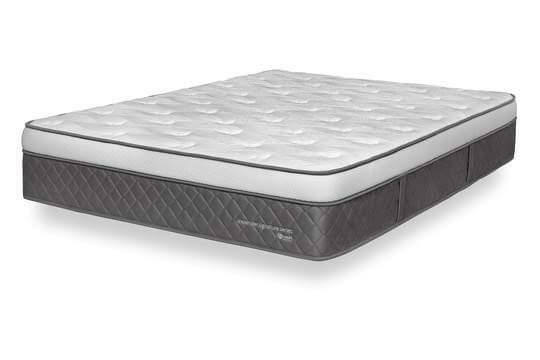 The coils are foam-encased, which means more cradling and less noise when you move on the mattress. The latex layer provides a cooling effect, a good amount of bounce, and some gentle cradling. And the foam comfort layers feature different density and offer both pressure relief and support. The absolute best thing about this top-rated mattress for scoliosis patients is, of course, its construction and the comfort it results in. It has eight (!) different layers, each of which has its own role in the ensemble. The manufacturer has put a lot of thought into this model and made it very supportive with a decent amount of cradling, which makes it ideal for people with scoliosis. 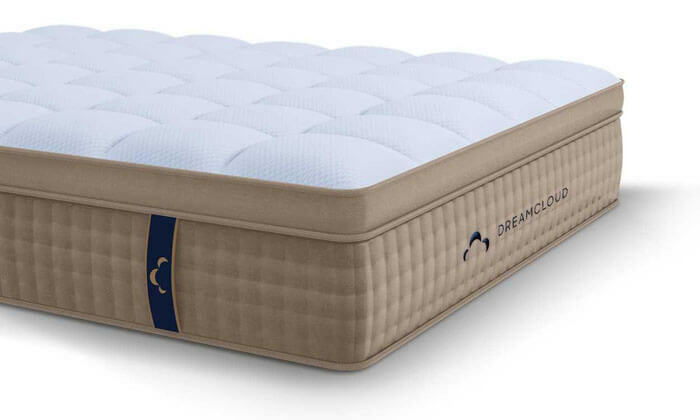 The worst thing about the DreamCloud mattress is the fact that it comes in only one firmness level, which might not be suitable for side sleepers. The top of the mattress feels rather bouncy and resilient. It doesn’t allow too much sinkage. Therefore, side sleepers might find this mattress too stiff for their pressure points. Overall, DreamCloud is a great hybrid mattress, which comes with a couple of nice surprises. It’s not a universally comfortable mattress, but it is suited for so many users, especially the scoliosis patients. The next model is absolutely the best mattress for side sleepers with scoliosis. Leesa has a very plush feel but provides enough support to keep your spine in a neutral position. This results in great comfort levels and users’ relaxation, providing them with a restful sleep. Leesa is a pure foam mattress. It has three different layers, one of which is breathable. This mattress gently cradles pressure points and allows a decent level of sinkage. It belongs to the medium-soft/plush mattresses. However, thanks to the dense base layer, Leesa also provides enough support to keep your spine aligned properly. The coolest thing about this model is its pressure relieving properties, which make Leesa the best bed for scoliosis. It is a rather hugging mattress with a moderate amount of bounce. It easily adapts to your body shape, allowing the pressure points to sink in deeper and reducing the tension on them. As for the drawbacks, the biggest issue you might experience with Leesa is, again, its softness, but only if you are a heavier sleeper (I’d say more than 250-300 pounds). The foam comfort layers simply cannot hold larger users properly because of their softness. This also makes Leesa unsuitable for back and stomach sleepers. Here’s the deal: Leesa definitely deserves your attention. Especially if you are a side sleeper with scoliosis. It can give you that desired pressure relief and relaxation. If you’re looking for the best bed for scoliosis and want it to be safe and natural, you should definitely consider Botanical Bliss. This mattress uses only natural components and provides great comfort levels, even for people with back issues. Now, this model is a 100% latex mattress. It comes in three thickness and three firmness levels. You can pick a 9-inch, a 10-inch, or a tall 13-inch mattress depending on your personal preferences. You can also choose between soft, medium, and medium-firm options, which means there is a mattress model suitable for any sleeping position. The best thing about Botanical Bliss is the quality of the materials used. It features certified organic latex, a natural wool lining, and a non-woven organic cotton cover. Such a combo results in both safety and great comfort levels. The worst part is the fact that this mattress is rather expensive. Of course, this is natural given the quality of its materials. Still, this factor makes Botanical Bliss unsuitable for some users, especially people who are on a tight budget. Despite some minor flaws, Botanical Bliss is definitely worth your attention. It is natural, comfortable, and even comes in different firmness and thickness options. This model deserves to be called the best luxury mattress for scoliosis for a number of reasons. It offers great pressure relieving properties and has a very luxurious feel, even though it doesn’t cost too much. 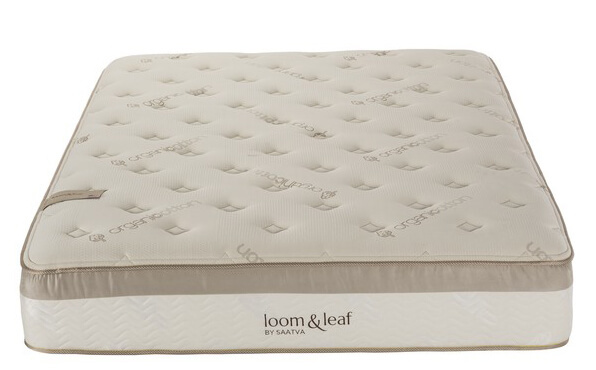 Loom and Leaf is a pure foam mattress. It has two base layers, which serve to support your body and keep your spine properly aligned (which is crucial for scoliosis patients). The comfort layer provides cradling, ideal for pressure relief. And the top gel layer ensures that you will not sleep hot. The coolest thing about this model is its balanced feel. It has just the right amount of cradling, which is exactly what makes it feel so soft and comfy. However, it also supports you nicely and doesn’t let you sink in too deep. It’s ideal for scoliosis patients and can easily keep your spine in a neutral state. As for the worst thing, I think this mattress’s edge support might really disappoint you. Especially if you need a larger sleeping space or tend to roll over to the edge during the night. To be honest, I really feel like Loom and Leaf is an affordable luxury. It feels and looks like an expensive high-end model while being sold at a relatively reasonable price. Moreover, it is very comfortable! Puffy has the potential to become the best bed for scoliosis. It is comfortable and simplistic. It’s a perfect option for people who aren’t looking for models with bells and whistles and simply want good pressure relief and support. 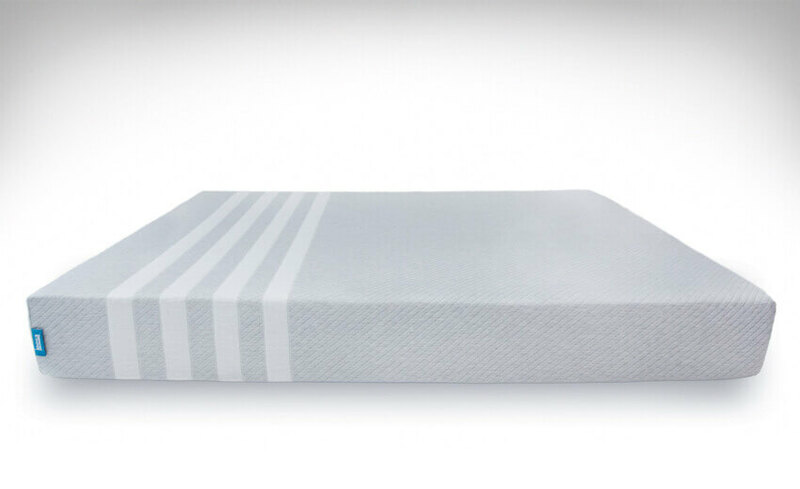 This is a foam mattress, which means it offers enough cradling for your pressure points. The base layer is quite dense and adds more support to the whole construction. The top layer has a cooling effect thanks to its Cooling Cloud technology. It also provides some extra softness and a gentle hugging effect. The absolute best thing about this top-rated mattress for scoliosis patients is the pressure relief that it provides. Puffy is cradling and adjusts easily to your body, gently hugging the pressure points and providing pressure relief. It is especially good for side sleepers. As for the bad stuff, Puffy might be too soft for two categories of users: heavier sleepers and back/stomach sleepers. Because it’s rather cradling, it will allow too much sinkage for heavier users. As for the stomach/back sleepers, this mattress is just not stiff enough. Despite some flaws, Puffy is a great mattress. It is plush and offers superb pressure relief, which so many users will appreciate. 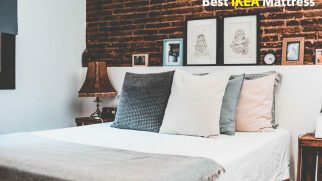 Why does this mattress offer the best value for money? Let me explain. First of all, it is very nicely made. It also has a smart and effective construction, which makes this mattress super comfortable. This model has a very luxurious feel while being sold at a relatively reasonable price. Now, there are 4 different foam layers. The top one is gel-infused, which means this mattress has good cooling properties. Additionally, there is a SmartFlow foam layer. It also adds breathability. This mattress comes in 2 firmness levels, medium and luxury firm. So, no matter what your favorite sleeping position is, you can get a suitable bed for yourself. You can also get the split King and Cal Kings sizes for you and your partner. What makes this mattress great is, again, the value for money that it offers. The combination of the materials, layers, comfort levels, and the option to choose between two firmness levels is a really great deal, in my opinion. Usually, such a mattress would cost around $3,000. But Nest Bedding sells it for $1,199 (Queen), which, in my opinion, is almost a bargain. The worst thing about this model is its edge support. 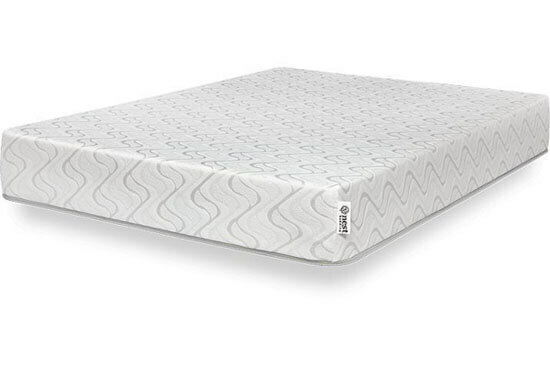 The foam is just too soft around the edges, which means you won’t be able to comfortably lie there. This limits your sleeping area, which might be a huge drawback for some users. Even though this mattress has a couple of drawbacks, it still has the potential to become your most favorite and comfortable bed. It’s great for scoliosis and different sleeping positions. Just pick the firmness level and enjoy your restful sleep. 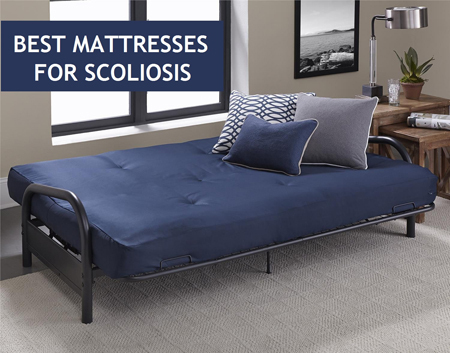 If you are on a tight budget but still want a great bed for scoliosis, you should definitely consider getting yourself this mattress by Nest Bedding. Love and Sleep is nicely made and features a simple but effective combination of layers. This is a memory foam mattress. However, it does not sleep hot thanks to the Energex cooling comfort layer. There is also a SmartFlow foam layer, which adds breathability and helps with proper ventilation. The mattress comes in two firmness levels, medium and firm. Therefore, there are different options for different users and sleeping positions. To me, that’s a very nice bonus! The coolest thing about this model is its value. 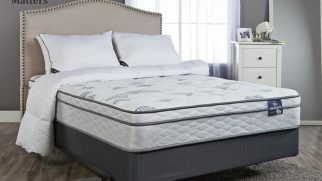 While being very affordably priced, Love and Sleep offers customization (thanks to two optional firmness levels), great construction, and comfort. By just paying $600 for the Queen size, you get a supporting, comfy bed. The absolute worst thing about this mattress is that it’s quite resilient and doesn’t have that classic “slow-hugging” memory foam feel. This might be a disappointment for some users. Especially those sleepers who love to sink into their bed. This mattress is not perfect, but I’m sure it can become the most comfortable bed for many users. It is very nicely made and offers a great value for money. Memory foam. This one, by far, is the most popular choice for millions of people. It is contouring, responsive, and is able to easily adjust to your body shape, which makes it great for the pressure relief. Innerspring. 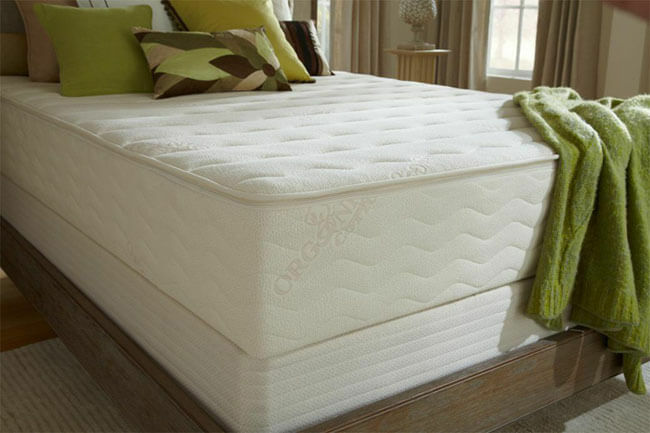 Oftentimes being combined with foam, the coil systems in mattresses provide bounciness and support. Plus, such mattresses are usually more affordable. Latex. This material is great for sleeping cool but also provides moderate cradling and decent levels of support. Hybrid. Being a combination of the three aforementioned types of materials, hybrid beds are able to give you the best of memory foam, latex, and coils. Their properties differ depending on the construction and layers, but there are many models that can work great for people with scoliosis. This rule applies to all mattresses, not only the ones for someone with scoliosis. Your favorite sleeping position is one of the most important factors. Now, if you’re a back sleeper, your mattress shouldn’t be soft. No matter how comfortable, plush, and cloud-like it feels, a soft mattress won’t be able to support your body properly. It won’t help you with the correct spine alignment either. You should give your preference to the firm models, the ones that can keep your body in a neutral position. As for the side sleepers, you might feel more comfortable on a medium firm mattress with a bit of padding. You see, when we lay on our side, we require the mattress to contour our bodies in order to “hug” the pressure points and relieve their stiffness. Sleeping on your stomach is not recommended, especially when you have scoliosis. Now, I realize that changing your favorite sleeping position is hard, but you should seriously consider doing that since sleeping on your stomach can actually aggravate your condition. Support. If you don’t want to make your back issues even worse, you should concentrate on finding a sleeping surface that will be able to support your body equally from head to toes. Mind that cheaper mattresses tend to sag over time, and the worst thing is that you might not even notice at first because it happens gradually. Sagging means the surface you sleep on becomes unlevel and changes in your spine begin. Conforming and pressure relief ability. While some beds have the ability to contour your body, cradling your pressure points and thus reducing pain, others have no conforming properties at all, which means you not only get no pain relief but also might give you new pains and aches in the parts of your body that didn’t disturb you before. Motion isolation. Another factor to consider for people with scoliosis, motion isolation stands for the ability of a mattress to absorb movement. People who suffer from pains at night might be more sensitive to their partner’s moving in their sleep and hence they are easier to wake up. If that’s about you, pay attention to memory foam and foam mattresses, as they usually respond to movement slowly and therefore provide better motion isolation. Noise. Similarly to the previous point, you might want to get a bed that doesn’t make noise when you or your partner move at night. Be careful with innerspring and hybrid mattresses, as they have a coil base that might be squeaky. Trial and warranty. I encourage you to always check the conditions under which you can return the mattress, whether it’s because it didn’t work for you or because it was defective. Sleep trial conditions provided by different brands may allow you to test your new bed during the period from one month to one year. As for the warranty, it is usually at least five years and up to a lifetime. Please, before you make a purchase, take time to read the conditions carefully to understand what is considered a defect and what is not. People with scoliosis suffer from different symptoms, have different pain points, and deal with various back issues. Therefore, there isn’t a universally comfortable mattress for all. However, I have a couple of good ones to recommend to different users. If you are a back/stomach sleeper and need great support with a moderate amount of cradling, consider Loom & Leaf by Saatva. This mattress is more on the firmer side, which means it will keep your spine properly aligned while offering moderate padding for superb comfort. However, if you are a side sleeper and need something softer, Alexander Signature Series by Nest Bedding might work the best for you. It is cradling and plush, with a decent level of support. Have you picked your favorite? Which one is it? Let us know in the comment section down below! I never thought to think a mattress could even make a difference for someone with scoliosis. I have some family members who suffer from scoliosis who are actually in the market for a new mattress so I’ll be sending them this way to read up on this!